We'll do all the heavy lifting to remove old furniture – whether it's one piece, or an entire office. 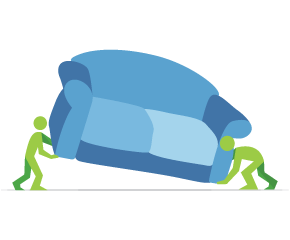 If you have a large entertainment center, old couch, or a mattress to get rid of, the heaviest thing you need to lift is the phone! We can pick up furniture from inside your home, out of your garage, or right from the curb – whatever is convenient for you. 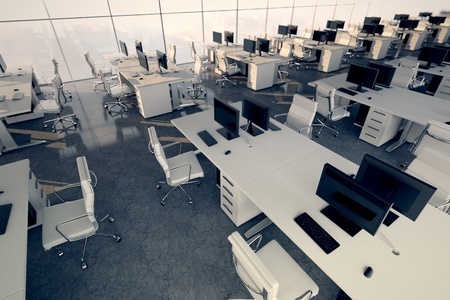 We also specialize in removing furniture from office spaces in high-rise buildings, commercial office parks, and retail spaces. If you live in the Phoenix area, we have a crew near you! Never any extra service call fees if you live in our service area. Sofa...couch? Aren’t they the same thing? Only to the unsophisticated and uncultured, which we are not. A couch is a poofy comfy soft magical place where naps can be had. A sofa is a bench covered in upholstery. Sorta like a church pew with a fancy towel on top. No naps are had here. That's probably why you want to get rid of it. Don’t worry, it's easy to dispose of. We take it and, if no one else can rescue it for their in-home chapel, then will send it to a recycling center where the wood can be extracted and turned into something much more loveable, like a piano bench. All those naps have taken their toll on your couch. You know there is a reason beds have sheets, right? They catch all the drool, sweat and dead skin cells your body secretes; also when you fall asleep every afternoon with a beer in your hand, you’re bound to spill a bit here and there. Just give us a call, and we’ll haul off your dirty old couch. We won’t even judge you for all the unidentified stains. We’ll take your couch to couch heaven where it can be part of something new after it gets torn apart and recycled. If you really love a great nap, you probably have a sectional, a huge monstrosity that can provide multiple napping positions. Unfortunately, too many naps come with consequences. Not to mention those who own sectionals probably have kids also. How else would you fit the whole family in front of the TV for family movie night? And kids mean spilled milk, smeared pizza, fuzzy drawings of what can only be garbage dumps and any number of “I don’t even want to know what that is.” Luckily, we know a guy. We can take your well-loved sectional off your hands and find it a new home or a new purpose. Everyone loves a quality entertainment center. Sadly, we all can't afford a high-quality item, so some of us end up with the garbage Crapmart, I mean Walmart, sells. Now we’re not judging, but if you’re doing your furniture shopping at Crapmart, then you should expect your furniture to be crap. And like all of their products, it will fall apart almost as soon, and you put it together. And now not only did you waste money on a Crapmart piece of crap, now you have to deal with getting rid of the crap too. At least we can help you with that. Give us a call, and the crap will disappear. You can look back on it as a bitter lesson learned. Next time try a furniture store. Everyone loves a good desk. Sometimes we love them too much, and they end up chipped, stained, and, just overall, worn down. As heartbreaking as it might be to let it go, a scrappy desk just isn’t functional. We’ll scoop it right up and see to it that it finds a lovely new home either by donating it or sending it to a recycling center. The hand me down table you got from Grandma, 10 years ago, just isn't holding up the pressures of life with 3 kids. It's too small, its constant wobbles make you feel like dinner served with a side of Earthquake. There's probably not enough duct tape in the world to keep it together for even one more meal. Don’t worry, tables are no problem. Just leave it where it sits, and we’ll move it right out for you. You'll spend over a third of your life sleeping in bed. You know who else sleeps in your bed? Dust mites; between 100,000 and 1 million of them. Like all bugs, mites leave dropping everywhere. And why do they live in your mattress anyway? Because they like to eat your dead skin, which you shed all the time. So ... gross. Get a new bed set, we'll put on a hazmat suit and take your old one out to the river bed and set it on fire. At AZ Junk we do it all, literally. We know, people overuse the word “literally” these days, but in this case, it actually applies. We don’t just de-junk homes and offices, we take care of retail spaces too. We can handle any type of storefront clean out you have. If you’re closing your doors or just relocating, we will handle the cleanout for you. That means shelving, counters, clothing racks, desks, display stages, office equipment, old storage and inventory, trash and junk. Anything you need to be hauled off, donated, recycled, or thrown out. When we’re done there won’t be anything left but the walls. Our 20 years of experience working with office furniture gives us the know-how to quickly dismantle your office furniture and remove it. Our hours are flexible, so we can work after-hours to fit around your schedule. We can work with your property manager or building manager to make things go smoothly. Difficult high-rise clean-outs are our specialty. We are insured, and we will make sure your commercial hauling needs are handled professionally. Your family business has been thriving for over 50 years, due to all the love, sweat, and tears you’ve poured into it. Sadly, the same cannot be said of your company desks. Desks are great, but they just can’t hold up to the wear and tear of 50 years worth of work. When it's time to replace them, we can easily take care of the old ones. We can sweep in and haul them off in no time, making sure they find a new purpose at a donation or recycling center. Broken or not, these behemoths are impossible to deal with alone. When it's time for you to upgrade to a classy King Aruther style roundtable, make sure you give us a call to help you get rid of the monstrosity that currently resides in your conference room. After your wild Christmas Party, you’ve found yourself in need of new office shelves. We won’t ask questions or pass any judgment as we haul off every piece and shard, just keep us in mind when you're sending out invitations for next year. File cabinets, they are real heartbreakers. They promise the glory of organized paper store mass amounts of information for years on end. But alas, no file cabinet has ever lasted the test of time. The drawers will be the first to go, not lasting more than a year or two before they stick, squeak or simply fall out. Sadly, we can’t do without them. So when you need to replace your file cabinets, call us and we’ll take care of the useless ones. Your furniture won't just be tossed in some landfill. AZ Junk will give it a second life with a family that needs your donation. We work with donation centers and families throughout the Valley to ensure that your furniture will be reused. Call us today for all of your furniture donation pick up needs. We understand the need for a worry free clean up when it comes to working with estate properties. We are flexible to work around your schedule and we don't require you to be present when we show up. We can donate any furniture, electronics or other fair condition items. We also recycle any old items which meet scrap yard standards. With our 1-2-3 Easy Hauling service, you don't even need to be present for us to haul away furniture from your garage, backyard, curb or office – it's as easy as 1-2-3. You get a flat-rate, up-front price by phone or through our website. Schedule a pickup time – if we can access the furniture without you, then you don't even need to be home. We pick up your item, then send you a receipt by email including a photo of what we've done. Click to learn more about how clean up service providers charge. We've seen it all over the years, these experiences are shared here for your enjoyment and pleasure. When to Get Rid of Old Furniture? When It’s Haunted, That’s When. Don't see your furniture pricing listed? Have questions about hard to access furniture? Drop us a line, or give us a ring.